Milwaukee Wide Blade Tape Measures are Nothing But Heavy Duty. Featuring Nylon Bond Blade Protection and a 5-Point Reinforced Frame, they offer the Longest Life by resisting contamination wear and increasing protection when dropped. To increase productivity on the jobiste, Milwaukee Wide Blade Tape Measures offer up to 13 ft. standout for easy measurements. For added utility, Milwaukee Wide Blade Tape Measures have durable wire form belt clips and are lanyard ready. The DEWALT DWHT33975L 25-ft. Tape Measure is one of the toughest tapes on the market. This tape features Tough Case durable case construction which means more rubber, more metal and 5 screws. The Tough blade high carbon steel blade has a remarkable 13 ft. of standout. The DEWALT 26-ft Tape Measure is Guaranteed Tough thanks to a reinforced housing and a metal impact plate. They also have incredible standout at 13ft*, maximizing the users reach. The 3M and Mylar coatings increase the blade life and reduce blade breakage. The DEWALT DWHT33976L 35-ft. Tape Measure is one of the toughest tapes on the market. This tape features Tough case durable case construction which means more rubber, more metal and 5 screws. The tough blade high carbon steel blade has a remarkable 13 ft. of standout. Tougher Case. Tougher Blade Coating. Tougher Hook Connection. The DEWALT Extended Performance (XP) Tape Measure is our toughest ever. The XP Tape Measure is built around our Dual-Core Technology - a patented spring system that utilizes two retracting springs in a impact-resistant, heavy-duty case. The extra large end hook grabs construction material from all four sides making grabbing objects while taking measurements easy. The redesigned screw-free belt clip holds tight and is easy to use. Special Buy 8M/26 ft. 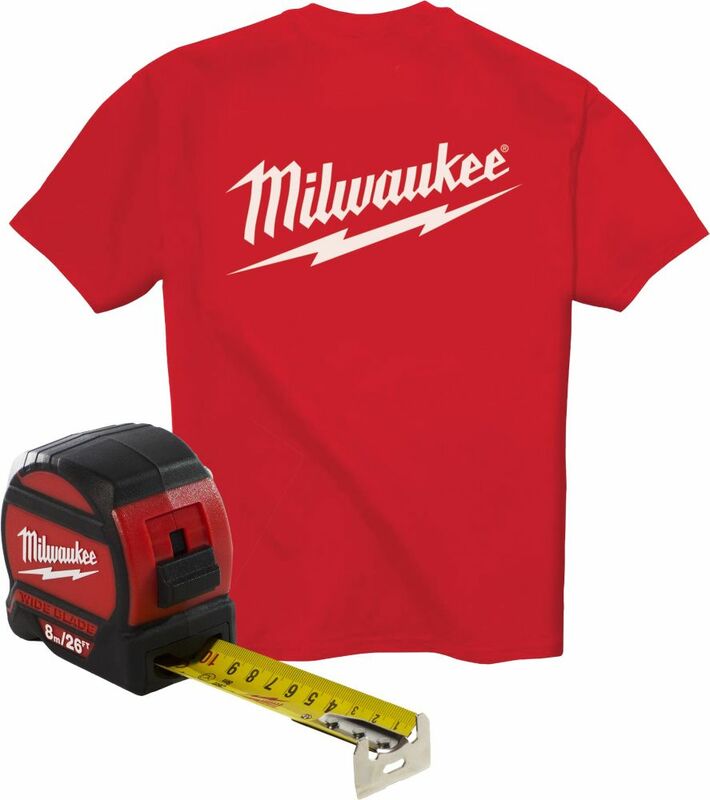 Wide Blade Tape Measure with T-Shirt Milwaukee Wide Blade Tape Measures are Nothing But Heavy Duty. Featuring Nylon Bond Blade Protection and a 5-Point Reinforced Frame, they offer the Longest Life by resisting contamination wear and increasing protection when dropped. To increase productivity on the jobiste, Milwaukee Wide Blade Tape Measures offer up to 13 ft. standout for easy measurements. For added utility, Milwaukee Wide Blade Tape Measures have durable wire form belt clips and are lanyard ready.